Like I said earlier, I had a vision. The little miss may not have caught a leprechaun, but it was fun to try! We know there was one in the house though; she had a green lip print on her forehead when she woke up and all throughout the day things kept turning green! As for the rest of our St. Patrick's Day, there were rainbows in all forms, lots of green, and of course, gold! I have been wanting to make this rainbow cake forever! I didn't follow the recipe exactly, I put whipped cream in between my layers and used a homemade vanilla frosting instead of a lemon buttercream. The cake is super moist and delicious. Although I had to get the idea out of my head that I wasn't eating play-dough every time I took a bite! Chocolate gold coins graced the bottom of the cake...gold at the bottom of the rainbow! A crepe paper rainbow and a pot of gold were found in the bathroom. Caramel chocolate pretzel sticks, stickers, green nail polish, shamrocks, and glittery green hats. 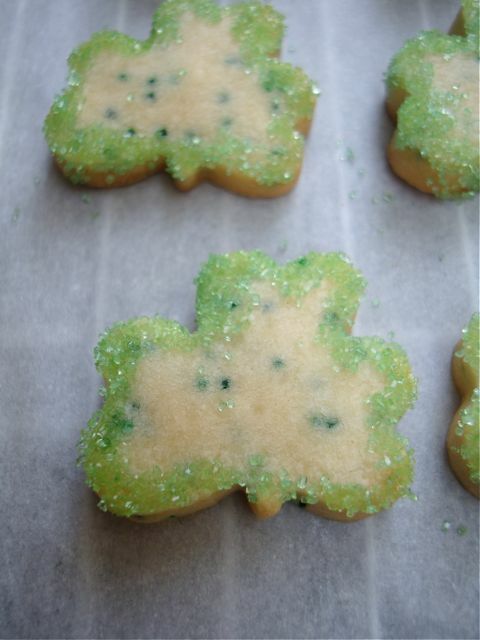 Here it is, my St. Paddy's Day version of the Love Bites I made for Valentine's Day. 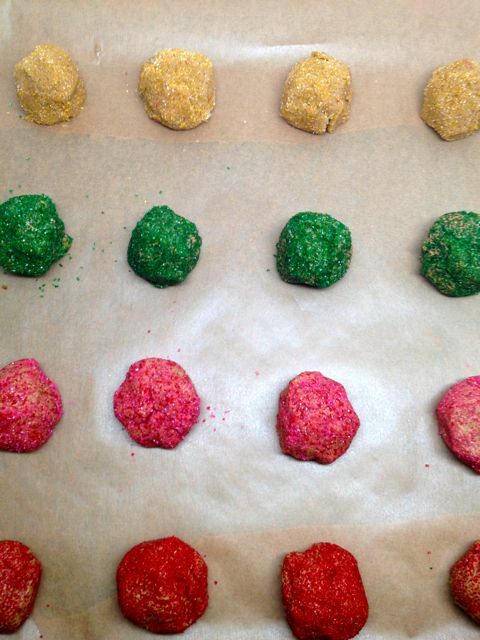 Substitute green for pink and switch the cookie cutter! Heat oven to 350. Cut out shapes from dough. Place on baking sheet 1/2 inch apart and bake for about 14-18 minutes, until just golden. Transfer cookies to rack, and cool completely. You can brush the edges with light corn syrup and dip into crystalized sugar for a finishing touch. Ridiculously easy and SO yummy! The best part? 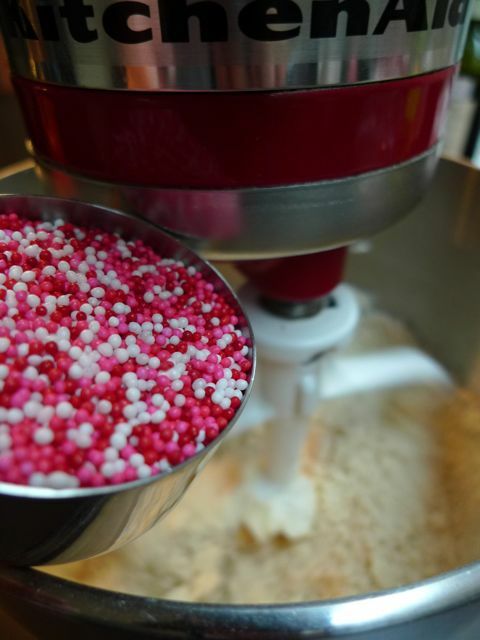 There's nonpareils in the dough! Heat oven to 350. 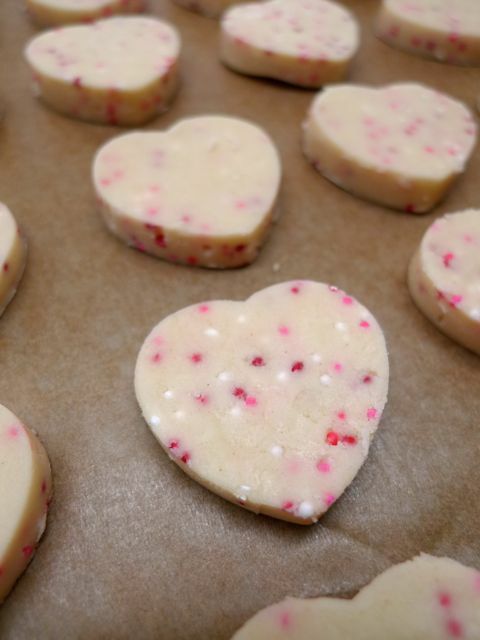 Cut out bite-size heart shapes from dough. Place on baking sheet 1/2 inch apart and bake for about 14-18 minutes, until just golden. Transfer cookies to rack, and cool completely. I dipped some of my cookies in chocolate which turned out to be a delicious combination. They are also just plain yummy on their own. Not to mention cute and mini! 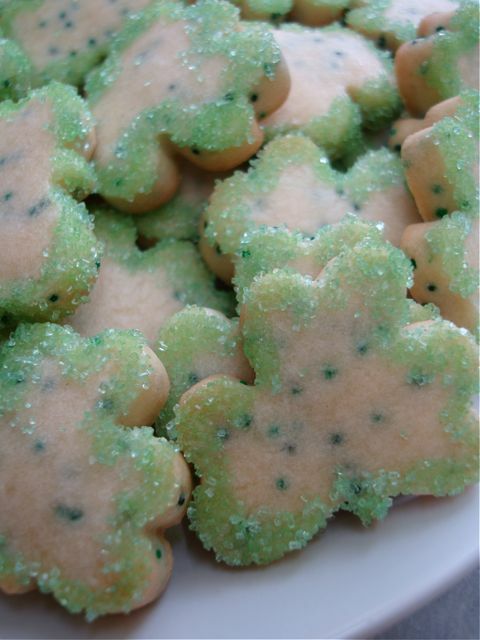 This recipe could easily be varied for other occasions...green nonpareils and a mini shamrock shape for St. Patrick's Day. 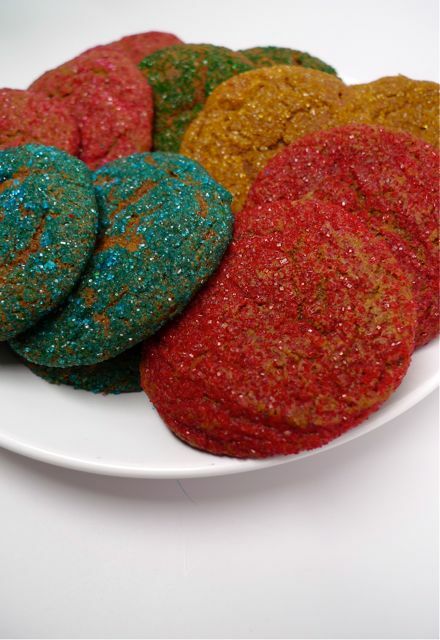 Or even just rainbow nonpareils in a simple circle or star would be cute. I'll keep this cookie recipe close by! Hello, little snowman! I was inspired by Martha Stewart's ice cream and coconut snowman. 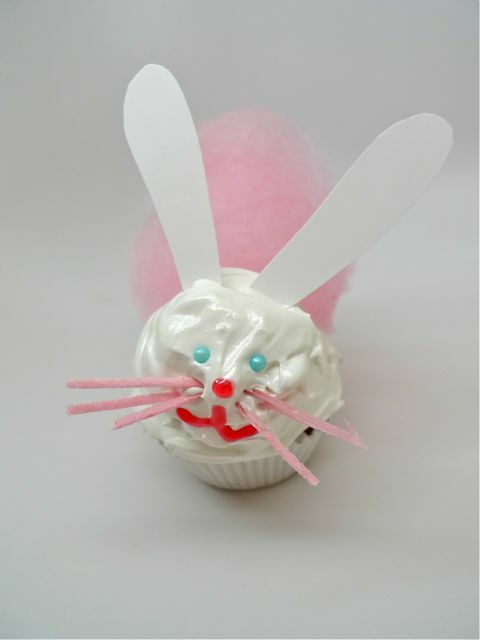 What a cute idea, but just not the right party treat for our toddler craft party. Hmm, what else is round and little? At first, I imagined plain donut holes that I would frost, stick together, and top off with a toasted marshmallow hat like Martha. Funny thing is, I couldn't find plain donut holes. After I thought about it some more, I realized that frosting on top of donuts was not really necessary (especially for two year olds!) so why not just powdered sugar covered ones? That just made the whole project SO much simpler! One skinny pretzel stick cut in half for arms. Put a dollop of frosting on your plate. Place one donut hole in the frosting. Insert toothpick into the center of the donut, pointy side up. Do not push all the way down. Add the second donut hole. Add the third donut hole. Use another toothpick to make indentations for your eyes, nose, and arms. Put a tiny amount of frosting in the holes to help hold everything in. Insert eyes, nose, and arms. Some whipped cream snow and a few sprinkles make a little more fun! These little snowmen go together in minutes! Sure, you could add a hat and a scarf if you wanted, but I like them simple and sweet. I can't help but smile when I see them. The girls LOVED them!